As dream jobs go, few would top that of spending a month with one of the cutest animals on Earth and then sharing the experience with others around the globe. And for the six lucky panda ambassadors - or "pambassadors" - who officially started work on Oct 8, it has just become a reality. Hopefuls quit jobs, postponed weddings and traveled thousands of kilometers to take part in the Project Panda competition, jointly launched by the Chengdu Research Base of Giant Panda Breeding and the World Wide Fund for Nature (WWF) China on Aug 16. The pambassadors will get up close and personal with the pandas at the base in Sichuan's provincial capital, detailing their experiences in a blog. Later, they will return home to act as global spokesmen and women for the endangered species. "We hope the publicity of the campaign can promote global awareness of animals and environmental protection," said Wang Jishan, head of scientific management at the Chengdu panda base. Judges last month whittled more than 60,000 entrants from 52 countries and regions down to just six - Huang Xi from the Chinese mainland, Wang Yu-wen from Taiwan, Yumiko Kajiwara of Japan, Ashley Robertson of the United States, David Algranti of France and Ali Shakorian of Sweden. China Daily caught up with some of the winners to find out what motivated them to take on the challenge of being a pambassador. 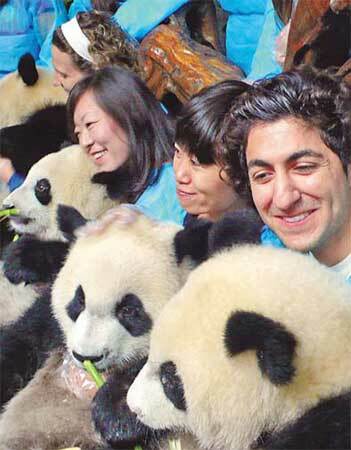 Ali Shakorian has a dream: To bring the first giant panda to his home country of Sweden. The 26-year-old post-graduate student grew up in Malmo, a large cosmopolitan city in the south, but did not see his first panda until he visited Berlin Zoo 10 years ago. He said it was "love at first sight" when he saw Bao Bao, the only panda in a German zoo. "Whenever pandas came onto the television, I wouldn't let anyone touch the remote control," said Shakorian, recalling his childhood. "I just stared at the screen and couldn't stop smiling." 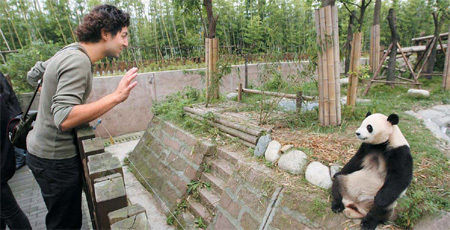 Fueled by his interest in the animal and its native home, China, the Swede moved to Beijing in 2008 to study Mandarin. He also traveled extensively within the country before returning home early this year. Shakorian was caring for his pregnant sister when he noticed an advertisement in a newspaper in late August for Project Panda. He said he quickly went online to get more details of the campaign. "When I found out only six people would win, I thought it was impossible for me," he said. "But I couldn't stop thinking about it and, as the deadline for applications neared, I couldn't sleep at night." Just a few days later, Shakorian's nephew was born and he gave the baby a panda costume he bought in China. The sight of the child dressed as a panda convinced him to change his mind about the pambassador job and he submitted a video application. "When I was told I was among the 12 finalists (who would take part in the last stage of the competition in September), I spent an entire day lying on the sofa trying to take it in," he said. "I never thought I'd return to China so soon and shoulder such an extraordinary assignment." In the final showdown on Sept 29, which lasted three hours, Shakorian performed a song he wrote called Setting You Free. "I believe the ultimate goal of breeding pandas in research centers is to release them into the wild," he said after being chosen as one of the six pambassadors. "I hope I can set a panda free one day." WWF Sweden is now talking to Shakorian about a tour of Scandinavia after he returns from his one-month training course at the Chengdu panda base.